Acne vulgaris is an inflammatory skin condition affecting over a million young adults worldwide. Acne is devastating to your self-esteem and appearance. Not surprisingly, many people with acne develop depression and anxiety. This can result in feelings of hopelessness and social withdrawal. Is it any wonder that the acne medication market will be worth over seven billion dollars by 2024? Luckily, there is a natural solution. A nutrient-dense, plant-based diet provides nourishment to all our body’s organs, including the largest one—our skin. If you want to discover how eating a plant-based diet can clear your acne and reduce future breakouts, you’ve come to the right place. Acne is present worldwide, but westernized cultures tend to see an increase in acne due to poor diet. Why is this the case? One of the biggest culprits is the glycemic index—the carbohydrate content—of foods. Foods with a lower glycemic index are slower to digest, resulting in a slower rise in blood glucose, and thus insulin levels. On the contrary, high-glycemic foods cause a spike in insulin, which stimulates the secretion of androgens or hormones and increases the production of sebum, which plays a fundamental role in the development of acne. Researchers have found a connection between high-glycemic foods and acne. The Standard American Diet is composed of many high-glycemic carbohydrates. 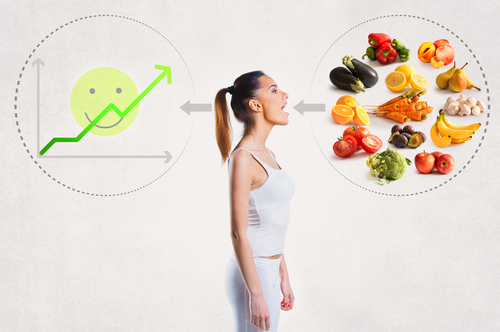 When you follow this diet, you exacerbate existing acne and give new acne room to develop. However, a 12-week study showed that a low-glycemic diet led to the improvement of acne. Since the Standard American Diet aggravates acne, naturally a diet in opposition to it would make it better. What diet is the furthest from the Standard American Diet? A plant-based one! Plant-based diets like the Hallelujah Diet, are agents of protection for your skin. For example, a study on the diets of people from Papua New Guinea and Paraguay showed acne was nonexistent in their culture. This is most likely attributed to their dietary choices. The meals of these populations are rich in fruits and vegetables and low in alcohol, caffeine, and refined grains. Most of their carbohydrate intake is from low-glycemic fruits and vegetables. 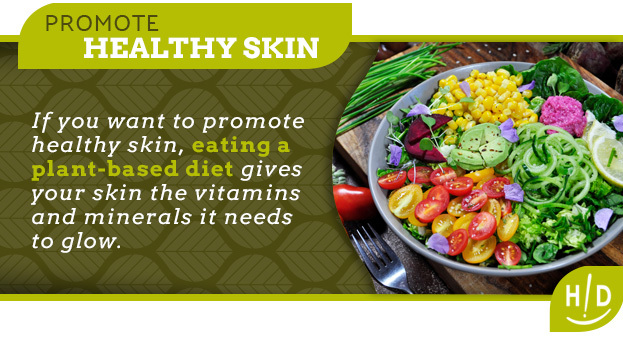 If you want to promote healthy skin, eating a plant-based diet gives your skin the vitamins and minerals it needs to glow. Vitamin A plays a significant role in the health of your skin by encouraging skin cell production. Choose foods with beta-carotene, a substance our bodies convert into vitamin A. Typically, these foods will be red, orange, or yellow, such as sweet potatoes, carrots, cantaloupe, collard greens, bell peppers, apricots, and winter squash. However, don’t overlook spinach and kale. These nutrient powerhouses also contain beta-carotene. Notice they are not orange? The presence of chlorophyll overshadows the beta-carotene, giving them their green color. In addition, peas and broccoli are other sources of this nutrient. Selenium is another important antioxidant for your skin. It protects cells from inflammatory damage and helps to absorb vitamin A. Some good plant sources of selenium include brazil nuts, onions, garlic, brown rice, lentils, peas, and potatoes. While vitamin A and selenium repair our cells, vitamin C works on damage control, healing past wounds. It won’t cure your current breakouts, but it will prevent scarring by repairing the cell walls from the scarring that blemishes can cause. In addition, it provides antioxidant protection against free radicals. 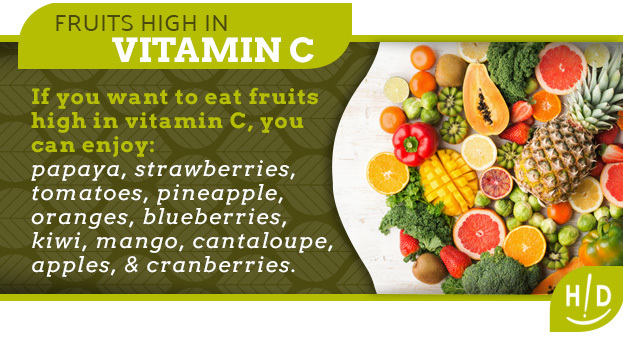 Vitamin C may be one of the easiest nutrients to get enough of since there are many delicious sources for it. If you want to eat fruits high in vitamin C, you can enjoy papaya, strawberries, tomatoes, pineapple, oranges, blueberries, kiwi, mango, cantaloupe, apples, and cranberries. Many vegetables contain vitamin C, too. 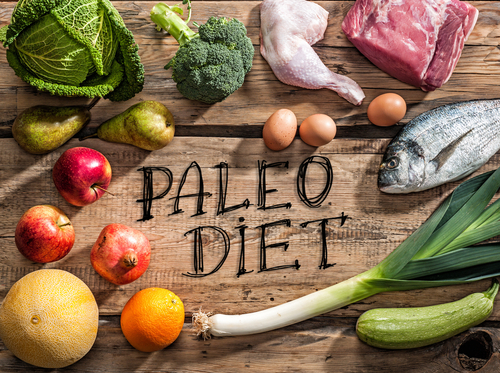 Add kale, bell peppers, chili peppers, broccoli, brussels sprouts, cauliflower, and artichokes to your grocery list, and your vitamin C intake will be plentiful! 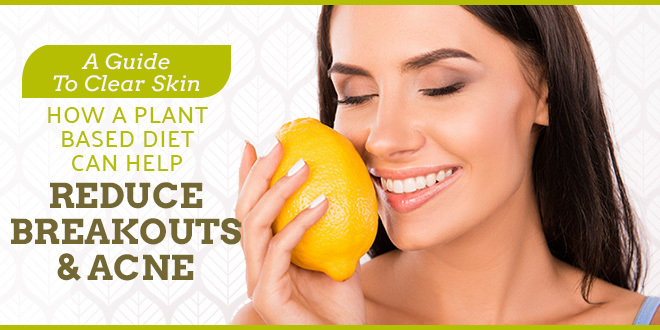 These fruits and vegetables are also rich in additional nutrients that benefit your skin. Pineapple contains bromelain, a chemical compound which decreases inflammation. 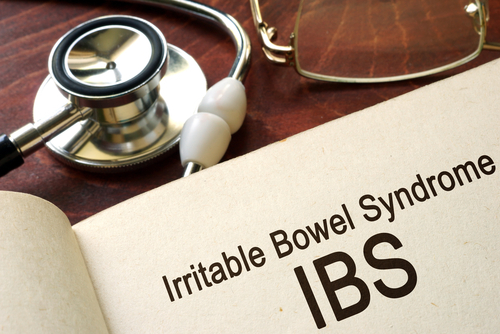 Cruciferous vegetables, such as brussels sprouts, have anti-inflammatory properties. Do you know why whole grains are better for your skin than white flour? White flour is made by stripping the bran and germ, leaving only the endosperm. By removing the nutritious part of the wheat crop, you are left with little nutritional value whatsoever. Replacing refined white grains with whole grains is good for your skin. Some ideas for grains to try include quinoa, brown rice, oats, amaranth, spelt, barley, buckwheat, millet, basmati or brown rice, rye, or teff. Buckwheat is especially good for you because it contains rutin, a material that helps your body produce vitamin C. More great sources of rutin include apricots, cherries, grapes, grapefruit, plums, figs, oranges, and black and green tea. Drinking plenty of water is sound advice for everyone to follow, especially those who wish to clear their skin. Water helps deliver essential nutrients to our skin and flushes toxins from our bodies. Healthy, radiant skin can be a reality when you stay hydrated. The amount of water you need to drink per day varies from person to person. Many people may want to aim for consuming 64 ounces per day. Luckily, there are many water-rich foods that you can eat to get enough per day. Vitamin E is a powerful antioxidant that defends our skin against harsh toxins that may lead to acne. Compared to vitamin C, which works at the surface level, vitamin E is crucial in healing our skin from the inside out. The benefits are so wonderful that many pharmaceutical companies choose to put this vitamin in their skin care products. Nuts and seeds are particularly good sources of vitamin E. Sunflower seeds are the richest nut source of vitamin E, then almonds and hazelnuts, followed by pine nuts, brazil nuts, pistachios, and pumpkin seeds. These nuts can be enjoyed as a healthy snack. Many leafy green vegetables include this vitamin. Spinach, swiss chard, turnip greens, asparagus, beet greens, and mustard greens are good sources. In addition, rye, whole wheat bread, kiwis, mangoes, and avocados also contain this nutrient. Vitamin E is fat soluble, meaning you need a little fat with your food for your body to absorb it. Try putting extra virgin olive oil, nuts, or seeds on your greens to absorb more of the nutrients. Antioxidant-rich foods are ones that limit the spread of free radicals in the body. Free radicals damage the cells in our bodies. By consuming foods rich in antioxidants, we can slow the spread of free radicals. While foods rich in vitamins A, C, and E all contain antioxidants, foods “rich in antioxidants” contain many vitamins and minerals known to benefit your overall health. These foods are powerhouses that will leave your skin glowing. Fruits are some of the best antioxidants. Berries are noted for their antioxidant properties, and strawberries, blueberries, raspberries, blackberries, and goji berries top the list. Some other sweet options include pomegranate, cranberries, apples, prunes, plums, cherries, and dark red, purple, and blue grapes. Raw cacao powder and non-dairy dark chocolate are also rich in antioxidants. Did you know that antioxidants are found in some of the most commonly used foods? Garlic and potatoes are staples in many dishes. Beans are also antioxidant powerhouses, especially black, kidney, pinto, and red beans. Herbs and spices such as ginger, turmeric, and cilantro are other good options. Nuts, especially pecans, contain many antioxidants, as do leeks, lettuce, and kale. 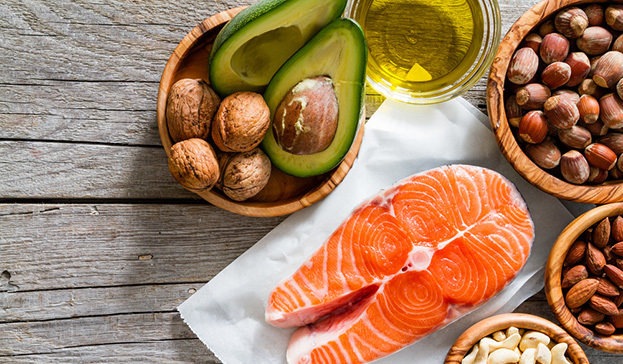 Eating omega-3-rich foods can help prevent acne by keeping inflammation at bay. Fighting acne successfully involves incorporating many omega-3 foods into your diet. Unfortunately, Western diets are often deficient in omega-3 fatty acids, especially when compared to other nations. Flaxseeds, chia seeds, and walnuts are all plant sources of this nutrient. 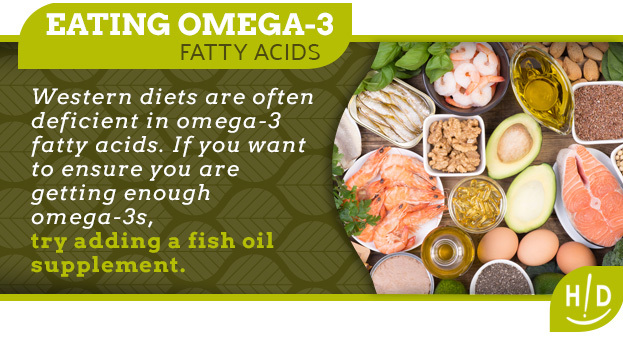 If you want to ensure you are getting enough omega-3s, try adding a fish oil supplement. Zinc is a nutrient that has been studied to fight against acne. Its anti-inflammatory properties reduce the appearance of acne and acne scars—similar to the healing powers of vitamin C. Plant sources of this include grains, seeds, nuts vegetables, and beans. Toasted wheat germ, oatmeal, wild rice, and quinoa are great sources, as are fortified whole grain bread and cereals. For an added boost of zinc, sprinkle pecans, hemp seeds, pumpkin seeds, sunflower seeds, flaxseeds, or chia seeds on your food. Beans, fruits, and vegetables contain zinc too. Black beans, kidney beans, shiitake mushrooms, green peas, spinach, white mushrooms, lima beans, avocados, and asparagus are good sources. Try eating a variety of these foods each week. While zinc is present in many plant foods, zinc absorption on a plant-based diet is low. To maximize your zinc absorption, you can supplement your intake of this nutrient. Hey everybody…load up on fruits and vegetables that are high in water content to help plump up your skin and better hydrate it. A,E,C, and Zinc are so important as well. A good fish oil supplement is always a good suggestion. Foods rich in antioxidants will help to make your skin GLOW. Who doesn’t like glowing skin! This is great advice to have especially with have teenagers in the home!